Just to state the obvious, it has been a lengthy amount of time since my last installment in my ‘Beauty & The Book’ series and while I am endeavouring to get back to it in the next few hundreds of words, this one is going to be a little bit different; there’s a connection between the beauty product and the piece of literature – as the book is a beauty-themed one – and they are created by the same company or individual. Paula Begoun’s “Don’t go to the Cosmetics Counter Without Me” Vol. 9 ($22.95): In any other circumstance I would be incredibly skeptical of taking complete (or even incomplete) skincare advice and information from anyone who had their own brand – simply because I wouldn’t be able to move past the suspicion that they were just saying what ever they wanted to spout in order to sell their product. However the visible improvement in my skin during the last couple of years thanks to her advice, the fact that she created her line as a response to the lack of products that performed well in respect to their claims, the truth that she is willing to recommend products from lines other than her own and that she cites studies to support her claims has all but eliminated this skepticism. This book provides a trustworthy account of her philosophy, the ways in which the consumer is mislead by marketing and general myths and how skincare can realistically work, whilst providing compelling evidence of why and educating the consumer on how what kind of ingredients and products to incorporate into their routines. It’s incredibly comprehensive and goes over skin concern, type and just about anything. And this is just before she reviews individual products from from a plethora of lines for a good 800 pages, which is incredibly helpful for sorting out what products you should include in your routine and the like. She and her co-writers somehow manage to do this without entering bland writing territory that bores one to tears. 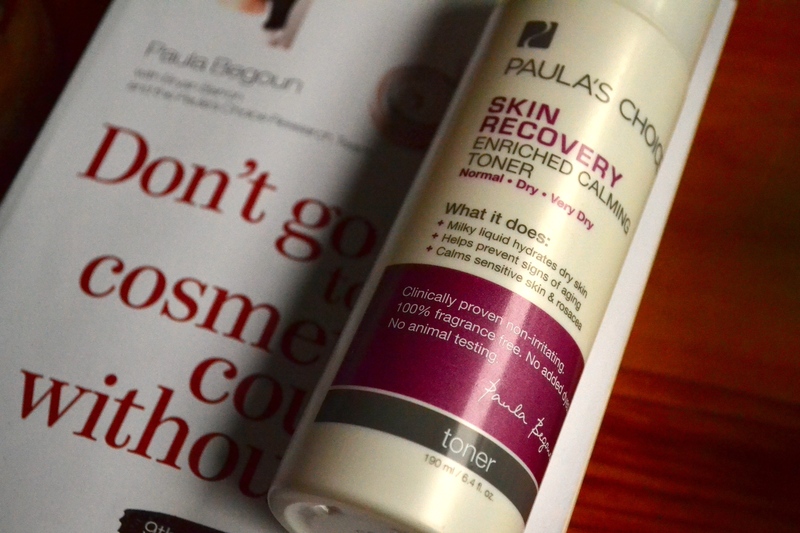 Paula’s Choice Skin Recovery Enriched Calming Toner ($20): For ages I’ve understood that there were such things as toners with non-irritating and even beneficial ingredients, but I never truly understood the allure of these hydrating milky liquids until this calming offering has entered my life. Unlike traditional toners in their ingredients, consistency and questionable efficacy, this is a lightweight hydrating serum served in liquid form with a plethora of beneficial ingredients and absolutely nothing known to be irritating. Just as a good serum or treatment should, this toner contains the usual hydrating ingredients along with a healthy dose of antioxidants, cell-communicating ingredients and ingredients that can combat irritation and inflammation. I could see the difference hours after my first application of this cloudy milky toner – my skin was notably less dehydrated, much more plump and radiant and calmed significantly. It has a healthy dose of the barrier-repairing hyaluronic acid, vitamins c and e, the cell-communicating niacinamide along with the expected nourishing plant oils. I’ve only been using this toner for maybe two weeks, but I’m definitely hooked. Paula started the books and recommending brands WAY before she started her own, so while sometimes she might be bias now, she was very neutral before she had her own line. I still respect a lot of what she talks about, and she’s one of the first professionals to break down all the marketing speak and talk about actual ingredients. I have her book in ebook form so it makes it really easy to do a search on my ereader!